By acting on the cellular metabolism, it transforms fats into energy and helps the reduction of fatty deposits, with a visible slimming effect. It effectively releases the fluids full of waste and toxins, purifying and detoxifying the body. This in salon treatment, as with all MAVEX treatments is free from parabens, paraffins, mineral oils and any harsh chemicals, and is produced with utmost respect to the environment. PERFECT BRONZE is a new retail item that is sure to be popular as we come into autumn as it gives a natural year round tan. It accelerates and intensifies the natural pigmentation process of the skin by stimulating tyrosinase; the biological mechanism that catalyses the production of melanin, helping it surface during exposure to the sun. It contains certified organic hyaluronic acid, of both low and high molecular weight to help the skin retain hydration deep into the dermis and epidermis. 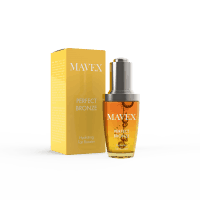 Perfect Bronze prepares the skin for tanning, reduces exposure time, prevents damage (redness, burning), accelerates natural tanning, fixes and prolongs the tan while deeply moisturising the skin. DIVINE BEAUTY is a new generation face cream that gradually releases a constant dose of active ingredients into the skin over the course of the day. It is available in salon and retail sizes. It renews skin cells, regains the natural firmness of the skin, while increasing hydration levels. With an antioxidant action it fights free radicals, improving production of fibroblasts and collagen which supports connective tissues. With a rich and melting texture, this cream revitalises the skin, while nourishing, moisturises and strengthens. It protects the skin from environmental aggressions such as pollution.